The SensiFAST™ SYBR No-ROX Kit has been developed for fast, highly accurate real-time PCR and has been validated on all commonly-used real-time instruments that do not require the passive reference dye ROX. 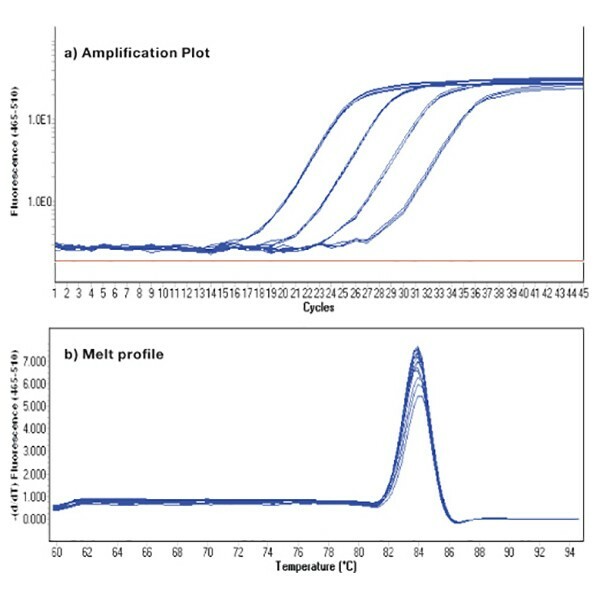 A combination of the latest advances in buffer chemistry and PCR enhancers ensures that the SensiFAST SYBR No-ROX Kit produces reliable assay results under fast thermal cycling conditions. An antibody-mediated hot-start DNA polymerase system promotes highly-specific amplification, in turn improving assay sensitivity and dynamic range. The SensiFAST SYBR® No-ROX Kit has been optimized to deliver optimal performance in tandem with the SensiFAST cDNA Synthesis Kit, which offers fast, unbiased cDNA synthesis, without compromising cDNA yield or coverage. The rps18 gene was amplified using SensiFAST SYBR No-ROX used a 10 fold serial dilution of cDNA over four orders of magnitude. The results illustrate that SensiFAST SYBR No-ROX is a fast (early Ct), highly reproducible and sensitive kit, with do detectable primer-dimers. Please refer to the Real-Time PCR Selection Chart to confirm the SensiFAST SYBR® No-ROX Kit is compatible with your instrument. "The performance of the SensiFAST SYBR No-ROX Kit is robust. We have used it ...	"
"We ran a comparison of the Bioline SensiFAST™ SYBR® No-ROX Kit to the ...	"
"I trialed the Bioline SensiFAST No-ROX kit and compared it to two other ...	"
"We use the SensiFAST SYBR No-ROX Kit and the Rotor-Gene 6000 for gene ...	"
"Amazing! Just take a look to the comparison I have made! And I did some ...	"
"Excellent amplification of Oct4 in induced pluripotent stem cells from ...	"
"We tested the SensiFAST™ SYBR® No-ROX Kit against the LightCycler® 480 ...	"
"We are using the Bioline SensiFAST SYBR No-Rox Mix for our qPCR studies. We ...	"
""I have been using a Bioline's qPCR mix (SensiFAST SYBR No-ROX, ...	"
""Very good linearity right down to 10 copies, very good correlation ...	"
""Great product, worked exactly how expected, and sensitive to small ...	"
""SensiFAST SYBR No-ROX Kit is a wonderful product, it makes all the ...	"
""In the course of optimizing real-time PCR for analysis of various ...	"
"In the course of optimizing real-time PCR for analysis of various animal tissues, I tested multiple real-time master mixes of different brands. The SensiFAST™ SYBR No-ROX Kit produced the most valid amplification result by improving efficiency and reproducibility. With this product, Bioline offers an optimal cost-performance ratio." "SensiFAST SYBR No-ROX Kit is a wonderful product, it makes all the difference between a successful and an unsuccessful experiment." "Great product, worked exactly how expected, and sensitive to small amounts of starting template." "Very good linearity right down to 10 copies, very good correlation coefficient, good qPCR reaction efficiency and gave a single band on an agarose gel." "I have been using a Bioline's qPCR mix (SensiFAST SYBR No-ROX, BIO-98020) for four years with Arabidopsis cDNA on a Bio-Rad CFX-96 and a Roche LightCycler-96 in 15 or 20 ul reaction volumes. I can highlight excellent technical replication, low baseline noise and good signal/noise ratio. Reasonable price quotations allow me also to stretch my budget. I know then that with an appropriate experimental design I can trust my results and expect them on time!" We are using the Bioline SensiFAST SYBR No-Rox Mix for our qPCR studies. We have compared the mix to the Roche Lighcycler 480 SYBR Green I Master Mix. With the Bioline SensiFAST mix, our targets regularly appear at lower Cp values and all primers tested work more reliably and consistently (see attached table for two examples of primer efficiencies determined with the Lightcycler and the SensiFast kits). Furthermore, Bioline technical support always answered our queries very promptly and in great detail and the SensiFAST mix costs us less than half the price of the Lightcycler Mix. We tested the SensiFAST™ SYBR® No-ROX Kit against the LightCycler® 480 SYBR Green I Master on a Roche Lightcycler 480. The cycling conditions we used were optimized for the Roche kit. Despite this, the SensiFAST kit performed significantly better, leasing to earlier amplification from comparable genomic DNA samples (see picture for example). This gives us the increased sensitivity we were seeking. On top of that it is much cheaper than the Roche mix. I highly recommend this product. Excellent amplification of Oct4 in induced pluripotent stem cells from 74ng/rx to 0.9ng/rx on Roche Lightcycler 480 with an efficiency of 1.98. Amazing! Just take a look to the comparison I have made! And I did some others as well: thaw/freeze cycles (4 times without any change), primers specificities (no changes). All the tests were free using small aliquots from Bioline. Only one thing would still stop you? The price is the lowest I've ever had. To me, using my conditions and all the tests I ran, this is the best mix for qPCR! We use the SensiFAST SYBR No-ROX Kit and the Rotor-Gene 6000 for gene expression studies on fruit crops. We tested different kits and the Bioline kit has excellent sensitivity and a competitive price level. I trialed the Bioline SensiFAST No-ROX kit and compared it to two other competitor qPCR kits and found it was much more sensitive resulting in lower CT values, even for poorly expressed genes that other kits have difficulty detecting. The kit is easy to use and good value for money. Highly recommended. We ran a comparison of the Bioline SensiFAST™ SYBR® No-ROX Kit to the QuantaBio “PerfeCTa SYBR® Green SuperMix” using a Biorad CFX96 real-time PCR machine. The Bioline product had lower saturation points for our qPCR reactions, but the amplification curves for the Bioline reactions were better and the Bioline product is a much cheaper option than the QuantaBio product. The performance of the SensiFAST SYBR No-ROX Kit is robust. We have used it with ABI 7900 and Roche LightCycler 480 for gene expression for a while. The studies include a variety of human and mouse primary cells and cell lines. We are very happy with the kit because of its sensitivity and repeatability and will continue to go with it. Lins P., Schwarzenauer T., Reitschuler C., Wagner A.O. and Illmer P.